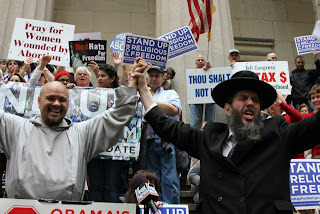 U.S. RABBIS TO FETE MOSCOW MAYOR | RabbiLevin.com - Fighting for Morality! Greetings and Shalom! On behalf of over 1000 Rabbis of the Rabbinical Alliance of America and the Union of Orthodox Rabbis of the U.S. and Canada, I wish to express the sincere gratitude and overwhelming appreciation of the Orthodox Jewish community internationally for your wonderful championing of G-Dly traditional family values. You are a true example of a pro-religious values government official, and we wish to hold up your courageous activities as an example to Mayors, Governors, and Presidents worldwide, including New York’s, Mayor Bloomberg, and Jerusalem’s, Mayor Loplianski. In this time of constant attack on the traditional religious family unit, your plain-talking truth is most necessary. We also recognize and appreciate the statements and support of the Russian Orthodox Church, and Patriarch Alexis. It is important that the faithful across religious boundaries vociferously and actively support any pro-family activities, which encourage family people worldwide. Thus, it would be my honor to represent hundreds of thousands of American Jews, Jews in the Holy Land and worldwide, in inviting you to New York to be the recipient of an honor at a special awards ceremony on either March 19th or 20th, or at another time that would be mutually agreed upon. We would host you in this international media capital, and also arrange for you to meet New York’s considerable Russian speaking and religious community for a day of celebration and honor. The impact and encouragement this would give religious and family people worldwide would be enormous. I plan to be in Moscow especially for the purpose of personally extending you this invitation and although this is short notice, I respectfully request that you grant me a brief audience with you to present you with a token of our appreciation, and extend you this invitation personally. If there can be an appearance in front of the media, it would also encourage millions. Furthermore, this meeting would certainly encourage even more support of your activities in this ongoing campaign, by the traditional Jewish community. I have been informed that this is the advent of the Lent period, and realize it’s a difficult time for meetings within the Russian Orthodox hierarchy. I also was informed that the Patriarch would be out of Moscow on Wednesday, February 21st, when I’m visiting. Nevertheless, may I respectfully request that perhaps Your Excellency can use his good offices to allow me to express our appreciation to the Metropolitan or another official of the Church either at the same time I may be allowed to make a presentation to Your Excellency, or at a time/place deemed appropriate by the Metropolitan. Again, profound thanks for your wonderful ongoing defense of traditional family values, and I hope and pray that Your Excellency, and the Eminent Metropolitan can honor my Jewish community by finding a small window of time to allow our message of solidarity for G-D’s Family values to warm the hearts of millions. If you do want to kiss @ss, at least get his name spelled correctly.